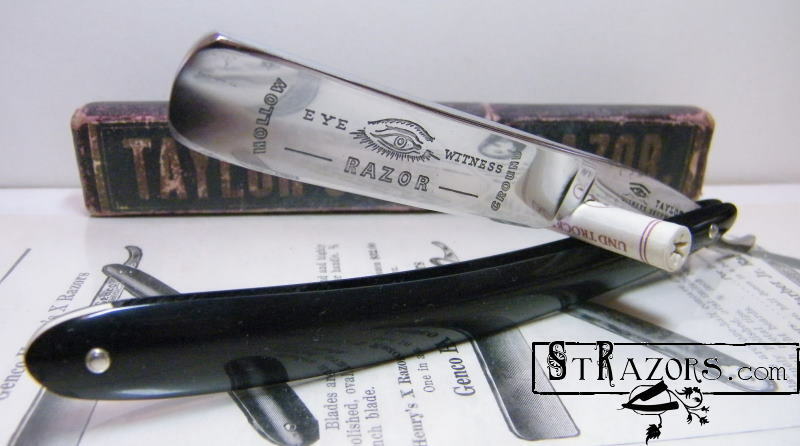 STRAZORS.com - all about classic razors - Taylors Eye Witness, Sheffield. This trademark was used by Needham, Veall & Tyzack. 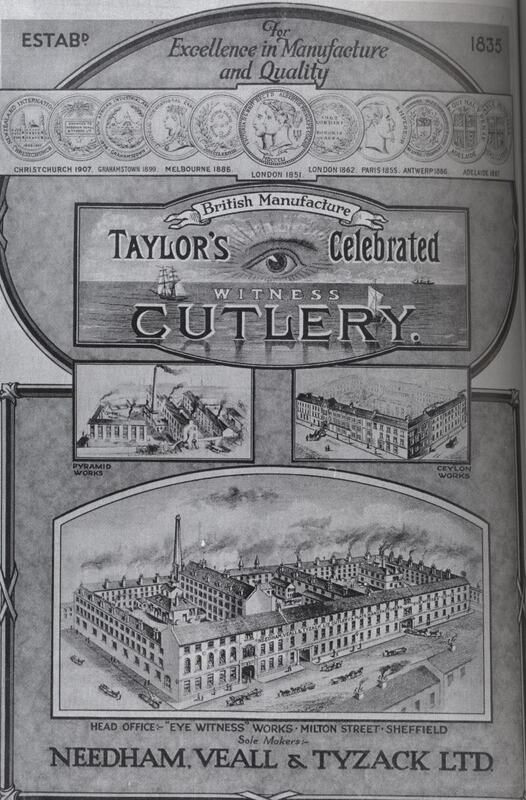 Taylors Eye Witness was founded by John Taylor in around 1820. 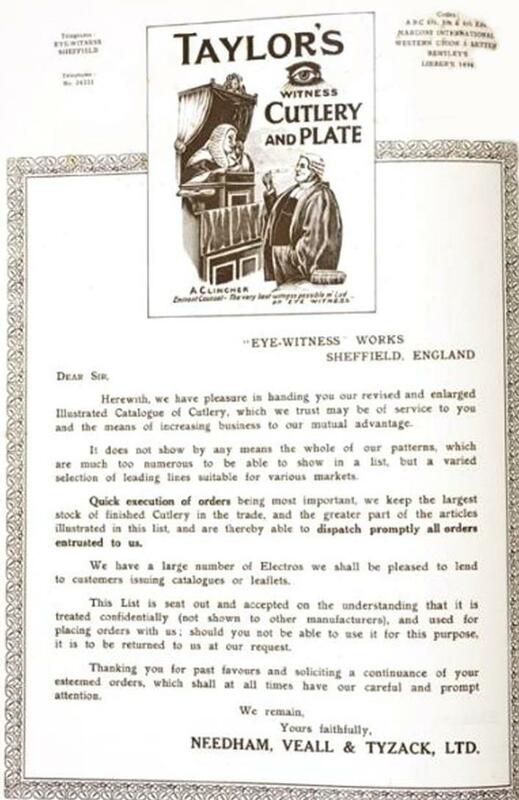 In 1838 Taylor applied for and was granted the Eye Witness trademark for his goods, it is said he chose it after being inspired by the line “No eye hath seen such” from Shakespeare’s Henry IV, Part 1. In 1852 Taylor moved to the newly built Eye Witness Works on Milton Street. At the time the works only consisted of five single storey bays and were driven by steam power with a 40 foot chimney stack which is still in place today. Upon the death of John Taylor in 1854 the firm passed to his daughter who had married into the Needham family who were also knife producers. The company became known as Needhams Ltd, joining forces with James Veall in 1876 and the well known local firm of Tyzack’s in 1879 to form Needham, Veall & Tyzack. After WWI, 1918, Needham, Veall & Tyzack was hit by the fall in the demand for high-guality pocket knives and razors. Walter Tyzack's response was to lead a merger of Sheffield cutlery companies. In 1919, he organized Sheffield Cutlery Manufacturers Ltd, which was a combination of his own company and Joseph Elliot, Lockwood Bros, Nixon & Winterbotoon, Southern & Richardson, and Thos. Turner. Bad management and poor trading conditions in the 1920's soon ruined this venture. Tyzack himself suffered a seizure in March 1922 and he retired to London, where he died on 24 January 1925. In the aftermath of this fiasco, Needham, Veall & Tyzack took over Southern & Richardson. W.C. Veall remained a director until his death on 23 February 1941, aged 74. Besides the firms listed above, it began to acquire other Sheffield names and marks: notably those of Saynor, Cooke & Ridal in 1948, Wheatley Bros, Parkin & Marshall, Hawcroft, and Brooksbank. In 1965 Needham, Veall & Tyzack became known as Taylor’s Eye Witness to take advantage of its well-known trademark. In 1975 it was bought by Harrison Fisher & Co. Eye Witness Works, Ceylon Works, Milton Street.